Sebastian River High School students volunteering for the Salvation Army. SEBASTIAN – The Sebastian River High School Red Kettle Club collected 1,601 lbs of food for the Salvation Army from March 4th – 15th. Vero Beach High School collected 463 lbs. 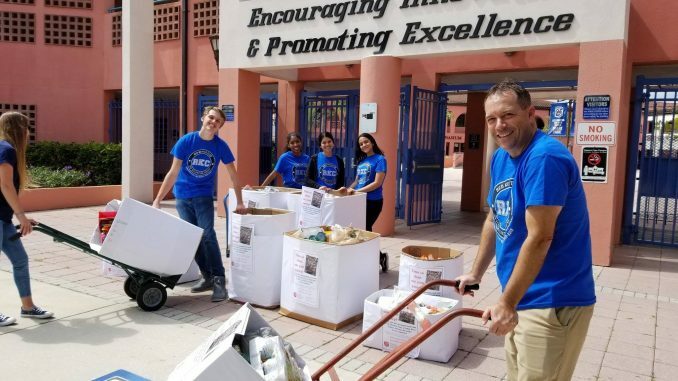 Between the two Indian River County high schools, they collected a total of 2,064 lbs worth of food. Each year close to 30 million Americans receive assistance from The Salvation Army. Their social services include providing food for the hungry, clothing and shelter to the homeless, assistance for the disabled, relief for disaster victims, outreach to the elderly and ill, and opportunities for underprivileged children. If you would like to start a Red Kettle Club at your middle school or high school and volunteer fill out the attached Red Kettle Club Charter Application.